Hi! My name is Joe and I’m a drummer. I hear the beat in everything and I let it play through my hands and I bring it. When I say everything, I mean everything. Yes, it’s in the music – beat holds the ground for a song. But it’s more. For me drumming is about everything being alive, and I’m free to express it. When I see something that inspires me – like the dolphins, say: they’re jumping, diving, gliding, playing… well, my hands just have to follow on this wild ride and suddenly the dolphins are pouring out of the cajón. My fingers are fast and free just like them. It’s a great ride. You can check out my dolphin rhythms here. Then there’s ‘Joe plays Joe’. That’s whatever’s going on for me – inside, outside. Changes all the time of course. I just express myself right then and there. Could be what I’m seeing around me. Could be the deep green jungle or a pattering rain and the wind in the trees. Hey, what’s that animal peering through the leaves? Maybe it’s a jaguar. Maybe it’s a howler monkey. I drum it. Sometimes I’m just hanging out or feeling happy or feeling sad. Whatever’s going on I let it happen through my drumming. If I’m stuck, I drum. If I feel the best ever, I drum. If I want to send a message, I drum. I love it. That’s me, Joe. 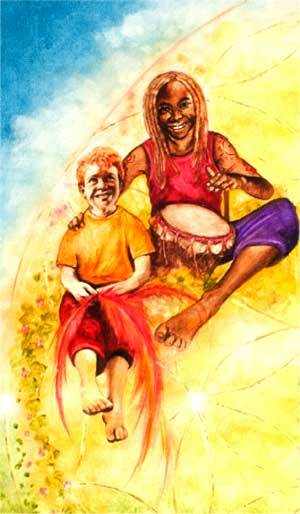 I want to tell you about The Rainbow People Tribe and of course I’m going to do it through my drumming. They’re all different and I love to catch the way they move their bodies and the smiles on their faces and the way everyone talks and chatters. Tap tap tapping. That’s how I met Nandita one breakfast. You know how someone says hello and the energy of that person meeting you really happens? Well, Nandita had that quick-now-hungry beat in her and I could feel it. I can express that the way some people paint a picture or take a photo. Hey, here comes Tess. She was part of that tree. William’s whistling with the birds. They always come around for him. Rai’s dancing with the flowers. Luke’s quiet, hanging out with the deer. Melody’s about to sing us some food. Salassie could be anywhere. Maybe he’s hanging out with the wind. 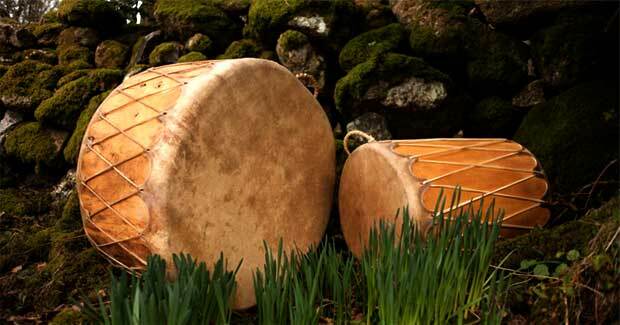 What I’m saying is, drumming is more than beats or rhythm or timing or groove, as well as all those things. Drumming is like the blood pumping through my heart. It’s how I know I’m alive. It’s how I know we’re all alive, and I love doing it. So tell me, what are your favourite beats? And what happens for you when you let go and let the drumming flow? Thanks to Lawrence Kelson for drumming Joe.